Documentation of the New Populations study of the Garifuna music, dance, and culture in New Orleans. Interviews were recorded on 8 cassette tapes in 2008 in English, Spanish, and Garifuna. Additional materials include correspondence between researcher Amy Serrano and Director Maida Owens, research concerning Garifuna history, and a DVD of Serrano’s documentary Sugar Babies. Digital material include copies of interviews in addition to performance audio, video, and photographs. Focused on the music and dance culture of the Garifuna, this New Populations project was carried out in 2008. Amy Serrano's project article, "From Punta to Chumba: Garifuna Music and Dance in New Orleans may be found on the New Populations page of the Louisiana Folklife Program's website". "My research methods and strategies involved a combination of one on one exploratory conversations with cultural or social service brokers into the community; educational meetings with actual members of the subject community; investigative research; observation of rituals by attending events hosted by community; once accepted into community, sharing their meals and collecting insight during gatherings; finding and listening to recordings of the community’s music, and learning to differentiate between rhythms and intention." Serrano, Amy. 2009. "New Population Project Field Report Garifuna Music and Dance in New Orleans" Louisiana Folklife Program. 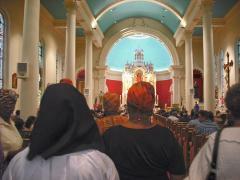 http://www.louisianafolklife.org/downloads/New Populations reports/Garifuna-Serrano-FieldReport.doc. XXXV. New Populations - Subseries 6. Garifuna Music and Dance in New Orleans.